Evgeny Kissin, two-time Grammy winner and activist in fighting for Israel, awarded citizenship at ceremony in Jerusalem. 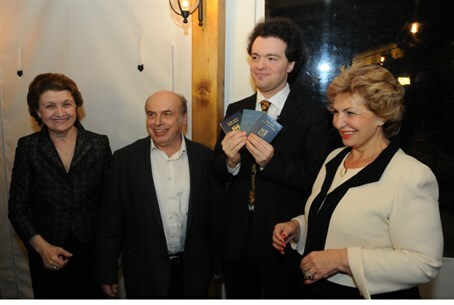 On Saturday evening at a ceremony in Jerusalem world-renowned pianist Evgeny Kissin, an enthusiastic Jewish supporter of Israel, was presented with Israeli citizenship by Minister of Immigration and Absorption Sofa Landver and Chairman of the Jewish Agency for Israel Natan Sharansky. Kissin, a two-time Grammy Award winner and widely regarded as one of this generation's greatest classical pianists, was given an Israeli identification card (teudat zehut) and Israeli passport. After receiving citizenship Kissin said "I would like to use this occasion to appeal to other Jews who live in the diaspora to join my example. If Israel is so dear to us, no matter where we live, let us be Israelis." He then added in Hebrew "I am with you, State of Israel, I am with you, my people. Now I can tell the whole world not only 'I am a Jew,' but also 'I am an Israeli.'" 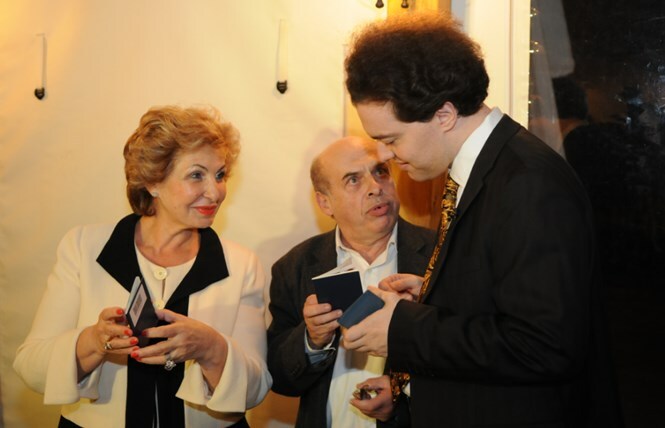 At the ceremony Sharansky commented that "Evgeny Kissin's exceptional desire to be a part of Israel is the most powerful answer to those young Jews who ask why be Jewish or why be connected to Israel." As an active supporter of Israel, Kissin has engaged in several efforts for the country, among them a fight against anti-Israeli reporting by the BBC in 2010. Kissin expressed interest in receiving citizenship to Sharanky around a year ago so as to "fight for Israel not only as a Jew, but also as an Israel. While Kissin is not permanently based in Israel, Sharansky recommended that the Israeli government grant him citizenship based on his significant contribution to Israel in the international arena. Moscow-born Kissin's prodigious musical career began when he started playing and improvising on the piano at the age of two; his international debut came at the age of twelve. Kissin has been called "one of the great pianists of our time," and in addition to the Grammy Awards he has received Honorary Membership in the Royal Academy of Music, as well as a variety of other honors. After being granted an honorary doctorate from the Hebrew University in 2010, Kissin remarked "wherever we Jews live, our thoughts, hopes, and prayers are always with Israel and with our ancient and holy capital, Jerusalem. ...I am proud of you, Israel, and I am grateful to providence for having been born a son of the people of Israel." Around the time when Kissin approach Sharansky about citizenship, the pianist released a public letter stating "I am a Jew, Israel is a Jewish state – and since long ago I have felt that Israel, although I do not live there, is the only state in the world with which I can fully identify myself, whose case, problems, tragedies and very destiny I perceive to be mine." Kissin further wrote that "when Israel’s enemies try to disrupt concerts of the Israel Philharmonic Orchestra or the Jerusalem Quartet, I want them to come and make troubles at my concerts, too: because Israel's case is my case, Israel’s enemies are my enemies, and I do not want to be spared of the troubles which Israeli musicians encounter when they represent the Jewish State beyond its borders."